Quite possibly one of the most intimidating disciplines for any filmmaker or video producer to tackle is color grading. Yet, it’s one art form that if mastered, could play one of the most significant roles in truly setting your work apart. It’s such an important aspect of the filmmaking and video production process, that there are huge post houses dedicated just to this task. Large corporate clients, production companies, and Hollywood studios can spend tens or hundreds of thousands of dollars on color correction and grading (also called color timing in the feature world). But what if you’re like me, a lone producer (or perhaps, part of a small team of a boutique studio) and the work you do doesn’t really have any budget allocated for a dedicated colorist. What is a “jack of all trades” and “wearer of many hats” to do when one of those “hats” doesn’t fit quite right? Well, first I want to assure you that basic color grading does not have to be as daunting as it seems. If I can do it, you can too. And today I want to show you a quick and dirty technique for color grading your film and video, and along the way, you’ll become more accustomed to the color grading tools already at your disposal. I would be remiss not to mention the use of LUTs and “Looks.” Many of you (like me) will most likely start your color grading session applying some sort of LUT (Lookup Table). These are pre-designed “looks” for your video that automatically adjust color, luminance, curves, etc., to help you arrive at a look you want. The purpose of this piece is to show you some color grading basics which will give you more flexibility to creating any look you want, with or without using LUTs. Have you ever seen a cool photo, or better yet, a film or video, and thought to yourself, “I wish I could color my films to look like that?” Well, for the most part, you can. Of course, a huge amount of the look of a film is created with art direction, lighting, and cinematography, but the color grade is also a powerful tool. This exercise will illustrate one of the foundational concepts of color-correction: shot matching. Whether we’re building a stylized look based on a reference image or just trying to get different cameras to cut together, matching two shots is an essential tool of the colorist. And it’s something that cannot be done just with preset LUTs. Before we get started you should know that I am NOT a professional colorist (nor do I play one on TV), and that’s kinda the point. You don’t need to be a professional colorist, or even an experienced user of color grading tools, to do this trick. I know just enough to be dangerous and to make my work look the way I want. So this will be a great exploration for those of you who want to expand your color grading skills, but are afraid to take that leap. At the end of this article is a short video tutorial using FCPX to do this trick. Feel free to jump right to that if you like. I’ll cover some additional details in the article. High-end colorists get paid well (and for good reason) to craft a “look” from scratch to match a particular film, but for beginners, it’s often more effective to find a piece of reference material with a look you like and then try to match your film to that look. That’s what you’re going to learn how to do today. I decided to use two Oscar-winning movies to perform my little experiment. I’m going to take the opening musical number from Damien Chazelle’s La La Land and match it to the opening of this year’s best picture winner Moonlight. Given what happened at the end of this year’s Oscar night, I thought it would be fun to use these two terrific films. Also, Moonlight has a very distinct look to it (one that I’m a particular fan of). I thought La La Land was a good starting point because most of the film is color timed to look “normal.” The colors definitely pop, and it has a rich tone, but there’s nothing about it that looks surreal or “stylized”. As is usually the case when it comes to filmmaking, the work you do in post production starts long before you enter the editing room. When it comes to color grading, it starts with how you capture your image. There are a number of considerations to be best prepared to color grade. We’ll start with the basics. In a perfect world, you’d color grade with a flatter image than this clip from La La Land. Saturation, sharpness, and contrast all play a significant role in the color grading process. In order to have the most flexibility, experienced filmmakers shoot their footage “flat.” That is, saturation, sharpness and contrast are significantly reduced in-camera, thereby allowing you to make them look the way you want when you start the edit. When shooting with DSLRs, I used to use the custom setting popularized by famed filmmaker and colorist, Stu Maschwitz: adjusting sharpness and contrast all the way down, and two notches down on saturation. I currently shoot with a Panasonic GH4 and the Blackmagic 4k Production Camera, and for the latter I use the Cinestyle profile and I shoot in the “Film” dynamic range setting on the BM4KPC. When shooting flat, the image you capture will essentially look lifeless. However, shooting flat will give you the most latitude when making color enhancements in post. The ultimate goal of this exercise is simple, and so we will use a simple tool to adjust the Red, Green, and Blue channels for the La La Land clip to match as closely as those channels on the Moonlight clip. To do that, I’m going to use the RGB Parade. Whenever color grading, it’s important, dare I say essential, to use scopes. These are built-in “monitors” of your NLE designed to show you the luminance and color values of your image. The three most popular scopes are the Histogram, Vectorscope, and Waveform. For purposes of this tutorial, I’m going to use the Waveform monitor and specifically the RGB parade. And here’s the RGB parade for the Moonlight clip. Now this is where we get down and dirty. 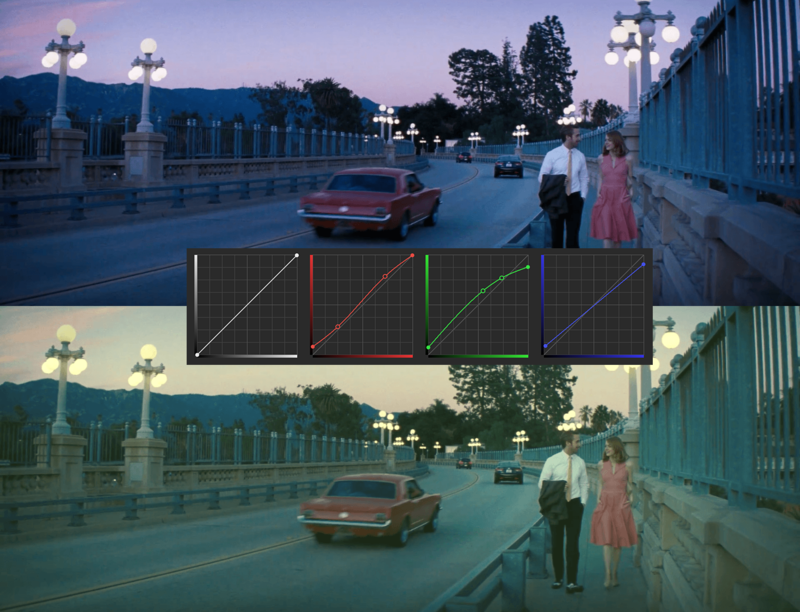 As I mentioned earlier, our goal is to adjust the individual RGB values for the La La Land clip. To do that we need to apply a curves filter. Most major NLEs will have such a feature built-in (like Premiere Pro, DaVinci Resolve, Media Composer) or if you’re using Final Cut Pro X, you can use any number for plugins and filters available in the FCPX ecosystem. In the past, I’ve frequently used Nattress Curves (available through FXFactory). But lately, my go-to color grading tool set has been Color Finale by Denver Riddle of Color Grading Central. It’s a whole set of color grading tools accessible directly within FCPX, including Vectors, Curves, Color Wheels and LUTs. For this assignment, I applied the Curves. The curves filter from Color Finale in FCPX. Now all we have to do is adjust the red, green, and blue values on the curves so that the RGB parade for La La Land matches as closely as possible to that of Moonlight. For each color, I grab the line near the whites (towards the top) and the blacks (towards the bottom), and adjust accordingly. I can even place multiple nodal points along the lines for multiple adjustments to the curve. And for the blue channel, I raised the blacks and lowered the whites. Here are the two RGB parades side by side (Moonlight on the left). Don’t expect the two waveform monitors to be identical. The distribution and variety of color in each clip will affect how the parade turns out. (Damien Chazelle and his cinematographer Linus Sandgren used a lot of primary colors, particularly in the two first big opening musical numbers.) But, as you can see from the results, I was still able to give the La La Land clip that bright, slightly nostalgic, slightly washed out grade reminiscent of Moonlight’s opening. If you’ve been hesitant to dive into color grading because it has looked too daunting a task; if you’ve relegated your grading tasks to simple adjustments in built-in color wheels (or color boards, as the case might be), give this trick a shot. For those of you who do this for a living, what other tips can you give? And for those of you like me who know just enough to be dangerous, what have been some of your best revelations?